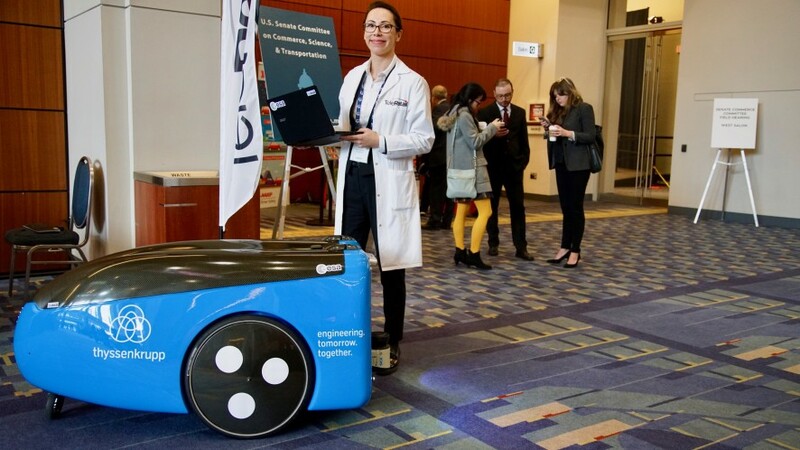 thyssenkrupp’s TeleRetail delivery robot was among the technical innovations and vehicles presented at a US Senate Field Hearing, held on January 24th at the Washington Auto Show 2018 in Washington D.C. U.S. Sen. John Thune (R-S.D. ), chairman of the Senate Committee on Commerce, Science, and Transportation, convened a hearing titled “Driving Automotive Innovation and Federal Policies” at the Washington Convention Center. The session focused on self-driving vehicles, and thyssenkrupp Elevator’s and TeleRetail’s groundbreaking delivery robot was named as a benchmark product. „Fast growing American Metropolitan areas need intelligent solutions to cover the last mile in delivering spare parts to our technicians. In connection with TeleRetail we are testing autonomous vehicles to solve this growing logistical problem,” explains Ivo Siebers, Senior Vice President of Global Logistics at thyssenkrupp Elevator. Self-driving vehicles already play a major role in the future of urban logistics – not in the shape of cars commuting people, but also in the shape of robots carrying and delivering goods. In collaboration with software developer TeleRetail, thyssenkrupp Elevator launched a pilot project in which delivery robots transport spare parts and other material to maintenance job sites. Perfect for maintaining elevators in a contemporary way, the robots represent the future of smart maintenance logistics, reinforcing thyssenkrupp Elevator’s position as a future-oriented mobility provider. Every year, the Washington Auto Show wows audiences with its cutting-edge exhibits and advanced technologies. More than 600 new models from over 35 manufacturers impress visitors while providing a glimpse into the future of mobility. Attendees can view thyssenkrupp’s TeleRetail delivery robot at booth MTI1 right in front of saloon H.
The delivery robots are just 85 cm wide and are suitable for traveling on sidewalks, thereby avoiding road congestion. They can also reach inner-city areas where vehicular transport is limited, carrying payloads weighing up to 35 kg. Information on delivery status can be obtained quickly via an online Logistics Automation Platform. “We hope to improve our service delivery in this way,” adds Siebers. TeleRetail is developing driverless delivery vehicles, and for thyssenkrupp Elevator they could be an optimal logistics solution for elevator servicing. The cloud-based driverless systems could form complete supply and logistics networks; a promising solution with enormous development potential. TeleRetail automates regional logistics while minimizing the ecological footprint of transportation. Its Logistics Automation Platform combines almost any mode of transport - Including couriers, taxis, drones, and self-driving transporters. Its Self-Driving Transporters automate urban logistics as well as intra-logistics for industrial clients. The company’s technologies reduce the space, cost- and energy requirements of local logistics up to 90% - thereby significantly improving the quality of life on planet earth.